Julian Smith will perform as Hartsville's Barton W. Mitchell at WILLow LeaVes of Hope on Friday, Sept.7th. Schedule: Doors will open at 5:30 p.m.
Entertainment: Sally Webster will perform music at 5:30 p.m. At 6:45 p.m. Julian Smith will perform as Hartsville Civil War veteran Barton W. Mitchell. 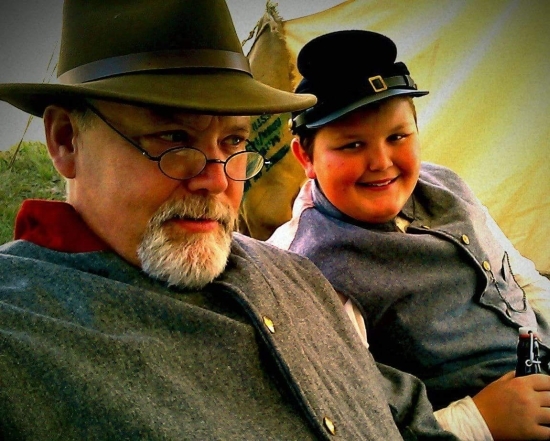 Bud Herron will take the stage as Hope soldier George W. Dixon at 7:15 p.m. Since launching in 2015, we have been blessed with the generous support of Tim Andrews, the Town of Hope, and the Hawcreek Flat-Rock Endowment and Heritage Fund, the Community Foundation of Bartholomew County. We have also received several individual contributions. Local businesses have sponsored us through their ads. We are extremely thankful and appreciative! However, we thought it important to try a more direct fundraising effort in helping even more with our estimated budget of around $19,000 for 2018 with 2019 soon to be here. We are pleased to present Once A Soldier. Bud Herron as Hope's George W. Dixon and Julian Smith as Hartsville's Barton W. Mitchell will be the featured acts at WILLow LeaVes of Hope on Friday, Sept.7th. Doors will open at 5:30 p.m. for guests to look around WILLow LeaVes and to enjoy dinner or a full salad bar for $15 while Sally Webster performs a mixture of her songs and songs of other artists. At around 6:45 p.m., Julian will take the stage with Bud following around 7:15 p.m.
Barton W. Mitchell was a corporal in Company F, 27th Volunteer Infantry Regiment of Indiana. After being wounded in the cornfield at Antietam/Sharpsburg, he took a voluntary reduction in rank to work on ambulance detail. He was already old to be a soldier at 46 when wounded but wanted to continue to serve when he could have been mustered out for disability. He later fought at Gettysburg. Afterward, he operated a sawmill in Hartsville. He died in 1868, three short years after the war, and is buried at the Hartsville Baptist Cemetery. Within the Hartsville Town Square, there is a plaque by the Indiana Historical Bureau which recognizes him for finding an important lost note from Confederate General Lee. George W. Dixon was a Private in Company I, 6th Indiana Volunteer Infantry Regiment of Indiana. George was Bud's great-grandfather. Bud first heard stories about George from his grandmother, Ette Dixon Herron, when quite young. Etta was George's daughter. He had shared story after story with her, and she in turn felt it important to pass them to others. George's first battle was at Shiloh, one of several he would fight. Like Barton, he was also injured but continued to serve until earning his discharge. He would eventually move his family to Hope where he drove a delivery wagon and did some blacksmith work. George died in 1910 and is buried in the Moravian Cemetery. Julian and Bud will take you on journeys, journeys often filled with great hardships and agonizing emotions. Bud will even share a few songs from that time period. Afterward, like me, I suspect you will be compelled to personally drive your car to follow the paths of Barton and George years ago. Julian was my student teacher. When taking a paternity leave for our first daughter, I did not hesitate to request he fill in. One of his three sons, Dietrich, was our first HSJ Online Hauser intern writer. Julian is still an educator. Bud and I were on the committee that searched for a way to keep our local paper after the sudden death of Larry Simpson, owner/editor/publisher of the Hope Star-Journal. Bud was a key member due to his rich history in the newspaper business. Both have a lot of local roots. The HSJ Online Team hopes you can make it to this worthwhile occasion. Larry Simpson had a high interest in the Civil War and was a key in Hope hosting Civil War Days. It is a way to remember Larry's pursuit of always having action on the Town Square and a way to help in continuing Larry's desire for our small community to always have a local media source. HSJ Online donation forms & envelopes will be available on tables for those wishing to make a contribution. If donating or pledging at least $25, then you will be able to take Bud's wonderful CD home, "Once A Soldier." Please call 812-546-0640 now to make a reservation.